Do y'all notice anything different about the blog today? Yesterday I finally took the plunge and purchased a domain name! Be on the lookout for a complete redesign soon! these are the places that I love getting cute t-shirts, tanks, etc. Basically, if you see me going to class or just running errands (or at the gym) I'll probably be wearing one of these brands! If you're looking for the perfect Fourth of July tank top, KMSS is the way to go! They have just restocked all of their tanks for the holiday & y'all, these tanks are not only the cutest, but they're so comfy! I have like 4 of their tanks and I wear them to the gym or to the beach, basically everywhere. If you use the code KMSSJSU at checkout, you get $1 off your purchase & if you go to their Facebook and Like & Share their most recent post, you'll be entered for a chance to win a Patriotic tank! These tees literally have the cutest designs, I love the turtle pictured! The boutique that I linked that carries these tees also has a huge selection of other Southern brands like Southern Shirt Co., Southern Fried, and Costa. These pair really well with Nike shorts or denim! Palmetto Moon (the boutique I linked) is currently offering free shipping on orders over $50! Every day really should feel this good, because the tees from VV are SO comfortable. Vineyard Vines is currently offering free shipping on orders over $125, which I assure you...they have so much cute stuff, it'll be easy to spend that much! I've loved this company for a long time, mostly because of their high quality and outstanding customer service. 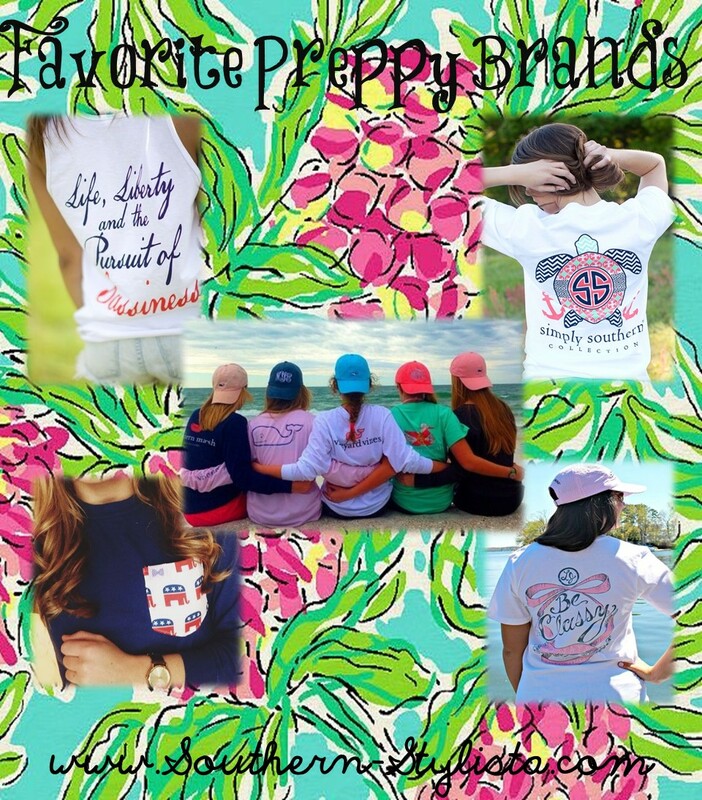 The tees, tanks, sweatshirts, and long-sleeved tees will last for years to come & the adorable pockets come in so many styles! The coupon code state (no capital letters!) will get you 10% off of your purchase! If you're looking for the world's softest shirt then enter Lauren James Co.
and now I own long-sleeve tees, oversized tees, and even koozies! But they don't only have comfy clothes, they have the cutest shorts and dresses in the world. Right now, they are offering free shipping for orders over $75! I hope y'all enjoyed this little roundup of some of my favorite brands. They are companies that I stand behind and I believe in! These are all great brands! Thanks for putting this together! I am absolutely loving this list! I'm going to need to stock up since I'll be moving to the south soon! Awesome roundup! I definitely remember some of these from people at college! Love being reintroduced to them! I love how a lot of them have pieces for more grown up styles, like Lauren James! Congratulations on the new domain!! I may not be from the south, but I love me some Vineyard Vines! Great round up and I can't wait to see the re-design of your site girl! Ahh congrats on your own domain--such a big step--one I totally need to take as well :) And what a great list--I am not from the south, but I still love it! I'm so glad you stopped by and that you enjoyed it! I love these brands! So fun to find another southern blogger! I've never heard of these brands but they look so cute! Thanks for sharing and congrats on the blog name! Ooooh a redesign- how fun and exciting! Congrats on getting your own domain name, and thanks for sharing these lovely brands. I love Vineyard Vines! !